Former President George W. Bush has opened up about his affection for former First Lady Michelle Obama, which surprised many people. To some, they might seem an unlikely twosome: a former president and former first lady from two different administrations, different political parties, different generations and different upbringings. But George W. Bush tells PEOPLE that he feels a real fondness for Michelle Obama. “She kind of likes my sense of humor. Anybody who likes my sense of humor, I immediately like,” says Bush, in an interview to launch his first art book and new exhibit, Portraits of Courage: A Commander in Chief’s Tribute to America’s Warriors, a collection of his paintings of post-9/11 war veterans. 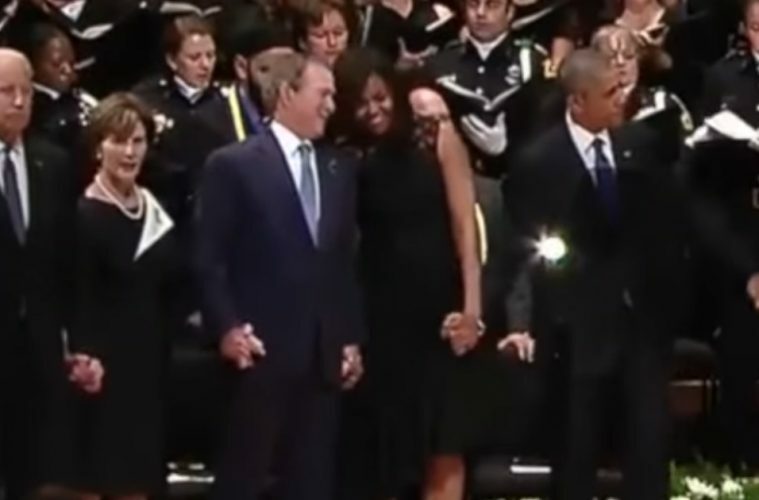 Bush, 70, notes that he was regularly seated beside Obama, 53, at official events like Nancy Reagan’s memorial service, an interfaith memorial service for Texas police officers last year, and the September 2016 dedication ceremony in Washington, D.C., to mark the opening of the Smithsonian’s National Museum of African American History and Culture. There, photos of the two of them cuddling on stage went viral.